Contract Lifecycle Management (CLM) software has transformed the way that individuals responsible for contract management handle their processes. Among the benefits of contract management software are shortened sales cycles and more accurate contract data. Let’s take a closer looks at specific ways CLM software improves contract management processes to achieve those benefits. A study published in the Duke Law and Technology Review found that 92% of surveyed lawyers stating that they regularly use contract management software for law-related tasks were satisfied with the software. The study noted that 33.2% of those lawyers were “very satisfied”. The researchers conclude that the software is most helpful in work that is going to closely approximate existing contracts. This means that enterprises dealing with real estate leases, trusts and estates, and even divorce papers could greatly benefit from the automation of contract drafting processes offered by CLM software. Further developments in CLM software now allow contract managers to handle more complex commercial deals and more nuanced agreements. Leveraging native integration with Word and drag-and-drop feature of contract clauses, Contract Logix allows contract managers across many industries to draft contracts faster. There are many reasons why CLM software facilitates faster contract review. One of those reasons is the use of contract templates, which provides several advantages. Unlike a paper-based contract management system, finding the right contract template doesn’t require contract professionals to physically walk to an office or wait for somebody to print out a copy. You can access necessary contract templates immediately and start working on them right away. This increases the knowledge and enforcement of business rules. Another reason is that CLM software enables you to spot the differences between two contract versions right away, decreasing human error and oversight of changes. Since all versions of a contract are stored in the same place it is easier to keep track of versions and changes – a much more structured process than trying to figure out the latest contract draft on an endless email thread on Outlook. A check-in/check-out feature also allows team members to know when to wait for the latest draft. Contract management software paired with e-signature software is a powerful combination. 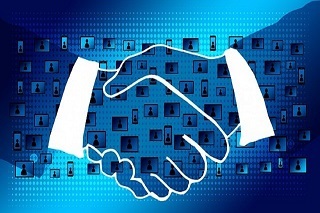 Here are two examples of how e-signatures streamline contract management processes. First, publishing house Pearson’s in-house counsel found that e-signature software provided 70% cost savings over a manual signature process and reduced signature turnaround time by 66%, according to an article published in the IACCM Journal. Second, the Office of the State of Hawaii had an average time between four and 12 days for a state document to be signed. With the use of e-signature technologies since January 2016, the Office State of Hawaii lowered that average time to between 129 and 181 minutes! Through a survey of 264 U.S. individuals who are responsible for the creation, editing, and/or management of contracts at companies with at least $5 million in annual revenue, Contract Logix developed a comprehensive view into the state of contract management in the business services industry. When asked to rate the extent to which certain contract management issues present a challenge within their organization’s management of contracts, 61.50% of survey respondents put having to deal with scattered contracts as one of the most pressing issues. Through CLM software, contract managers have uninterrupted access to latest pre-approved contract templates and clauses, enabling them to work away from the office or during off-site client visits. This is another way in which CLM software reduces the average time to complete a contract lifecycle. CLM software address this issues in 3 ways. First, OCR technology turns scanned documents into files with searchable text. Second, the software allows you to perform text-based searches across all documents. Since all documents are stored centrally, a text-based search is guaranteed to include all existing documents. Such a feat would be almost impossible in a paper-based system with physical documents spread around filing cabinets across the office. Third, you can customize CLM software that automatically trigger alerts when contract language deviates from pre-approved ranges or certain clauses are used for certain clients or types of contracts. To find more about how your peers at business services companies handle contract management, download the full report “Contract Management in the Business Services Industry: Roles, Tools, Challenges, & Obstacles”.